For those who have asked me for the route, I have put together all our recorded GPX files from St Jean Pied de Port to Santiago de Compostela and on to Fisterra and Muxia. You are welcome to use it for your own planning. If it helps you on your Way, please drop me a line. I plan on offering the Camino Português files next. I am reading about so much hate in the world after the Brexit vote and then the election of Donald Trump. It is a sad thing to see the democratic process turn to ‘mob rule’. I cannot change the world, but I can hold its hand, so I am going to do something different – and see if anyone notices. I have opened up a page for a charity which I support. I am not going to chase anyone for charitable donations, but I would like to raise awareness (and funds) to help those who help others. So many good people and causes to choose from. 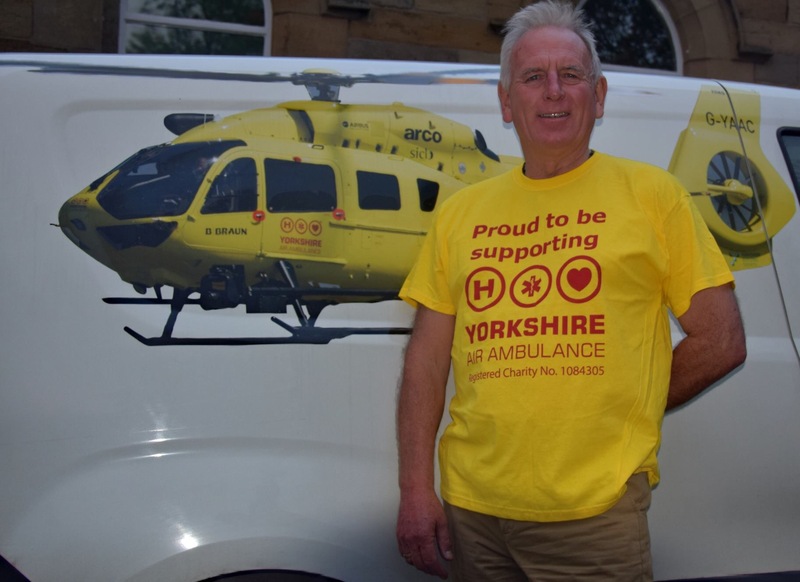 I chose to support a charity which (sadly) I see in the skies so often – the Air Ambulance. The group who run it do not live a champagne lifestyle – they volunteer to help those in need. I am linking this to my Shetland-to-Scilly bike pilgrimage next year. Peterhead is not normally in the top 10 of places to visit. True, the wind comes off the North Sea and it can be a wee bit chilly. This however is the view that greets Dorothy Cunningham, my mother-in-law each day. What do you think? 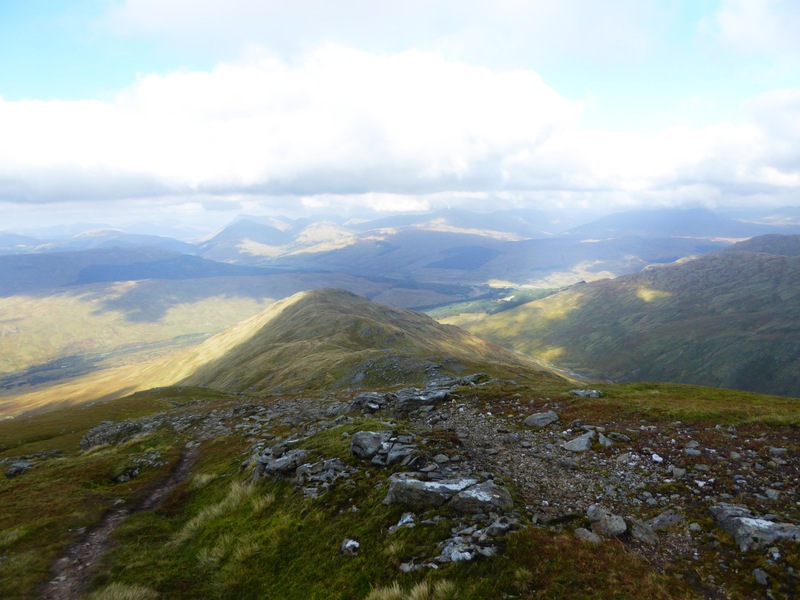 Yesterday I managed to climb to the summits of Ben More and Stob Binnein. 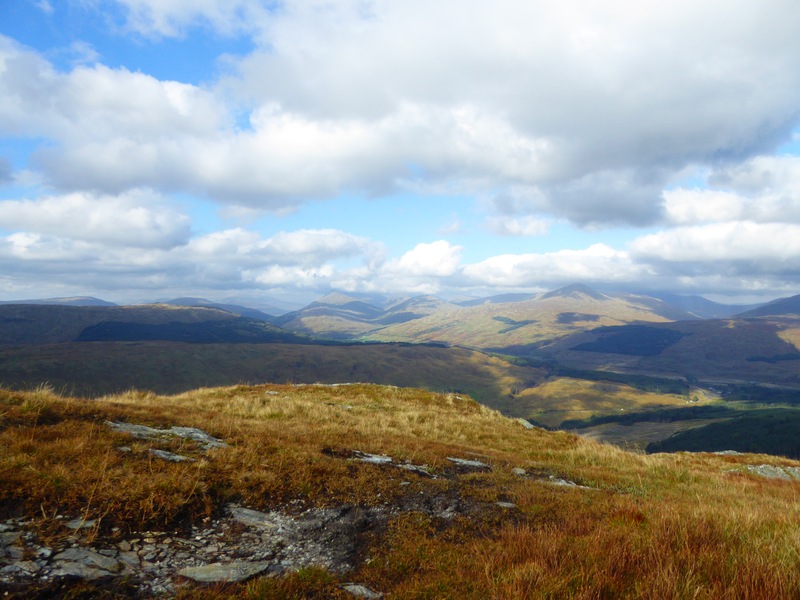 Today was to have seen my visits to two more Munros in the Crianlarich area, namely An Caisteal and Ben a’Chroinn. What I had not foreseen (and neither had the Met Office I suspect) was that the band of warm, accelerated air lying to the west of the UK, would choose this day to make a fast trip along the West Highland Way. 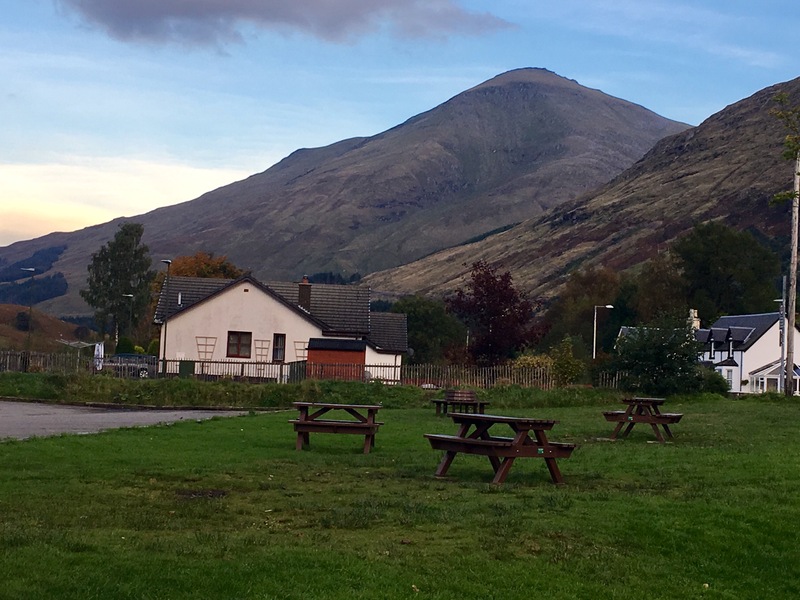 I have been staying in the Youth Hostel at Crianlarich. This has to be one of the very friendliest places to stay. Jools was a great host to welcome me each day as I trudged in after a day on the hills. Her two colleagues, Karolina and Fiona make for a great team. Crianlarich SYHA has restored my faith in Youth Hostels. 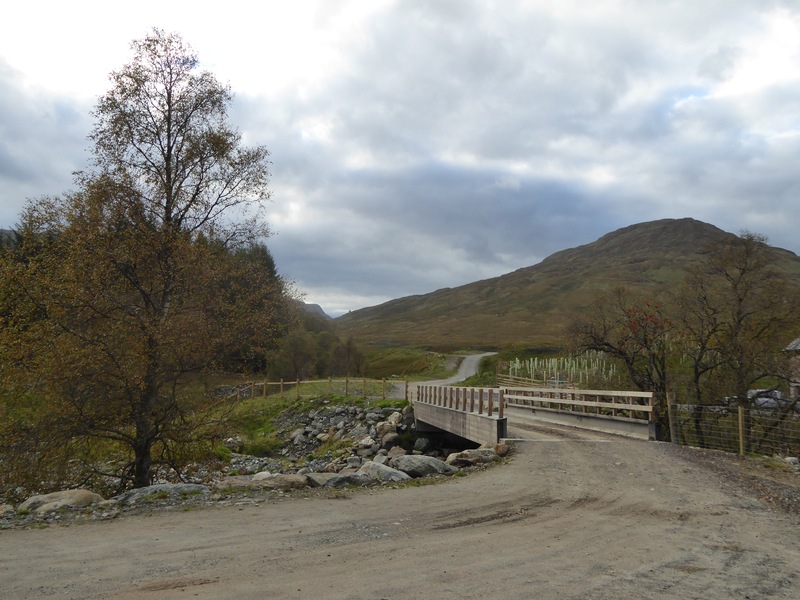 The day started bright and in Crianlarich there was hardly a breath of wind as I set out. The route up to the ridge which terminates in An Caisteal is passes through a wet, oozy, glug-sluck morass. There is a path – I was told – but invisible at ground-level. 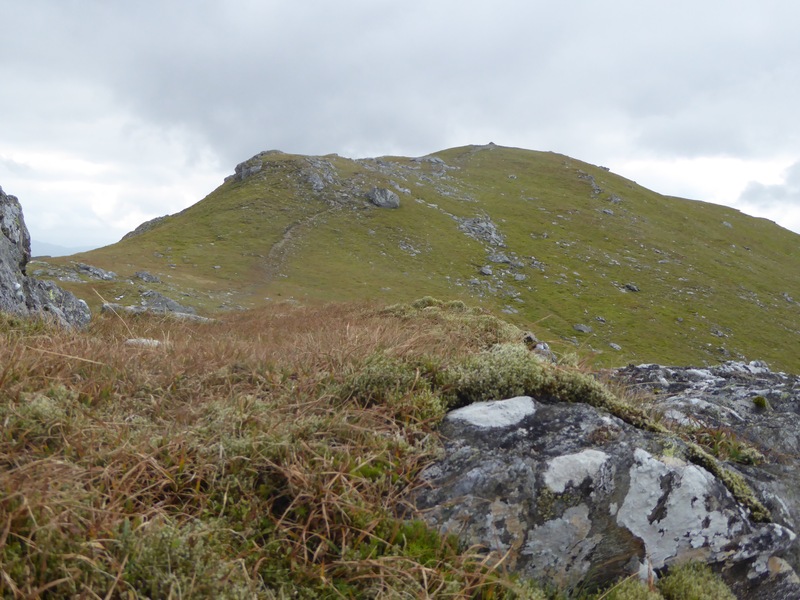 Eventually, on the ridge at 700m, I saw An Caisteal. Easy-peasy I thought. Two kilometres and 250m. No problem…Famous last words. That mild breeze in the valley had become a stiff breeze on the top ridge. It was coming across the glen, and accelerated to get over the ridge. It accelerated more and more as the ridge got higher. At the summit itself, a vertical stance was impossible. 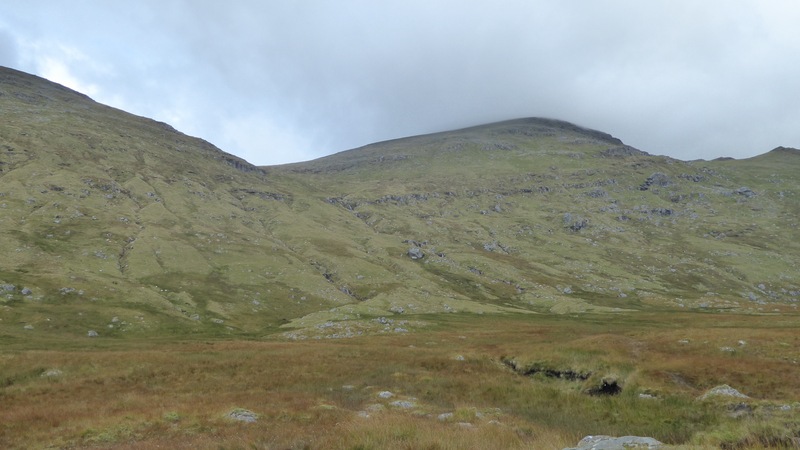 Once there, I looked at the route to Beinn a’Chroinn and the narrow bealach between the two peaks where the wind would be accelerated even more. I realised that on that exposed stretch of just 200m, I had every chance of becoming a ‘Search-and-Rescue’ statistic. So – I turned back. That decision in itself was a struggle. Almost as soon as I turned back, the clouds parted and the day was bright – but still windy. I had a view of the hills I climbed in mist yesterday. The views to the north western Highlands were eye-achingly beautiful. Along the way I met another walker. He was Russell Stewart from Glasgow. Another ‘old bagger’ like myself. He had already figured the wind would be bad at the summit, but as he said, he did not have far to drive to attempt the hill in better weather. I sat in the wind-shadow of a rock, taking in the view and my favourite ‘Coronation Chicken’ sandwich. It is amazing how delicious tea and sandwiches taste on a high mountain ridge path. Munro Madness some call it. It looks like I have it – along with ‘The Call of the Camino’. While I have your attention – spare a thought please for those who put themselves in harm’s way to help us in our need. The paramedics, firemen, lifeboats, search-and-rescue, air ambulance…. Today I decided to avoid a move which could have triggered a need to find my body if it had gone wrong. Ben More and Stob Binnein demanded everything I had. Those two opponents, AD and KG did everything they could to stop me. AD (Ano Domini), will kill me eventually but will have to try a wee bit harder. He caught my knees today, around 1000m above sea level. He was helped by my other adversary KG (Kilo Gram – whom I have in my sights). So today, alone in the clouds – I needed inspiration, and so, I touched ‘The Happy Isles’. I did not yield (*). This was a return to the Highlands after 19 years. 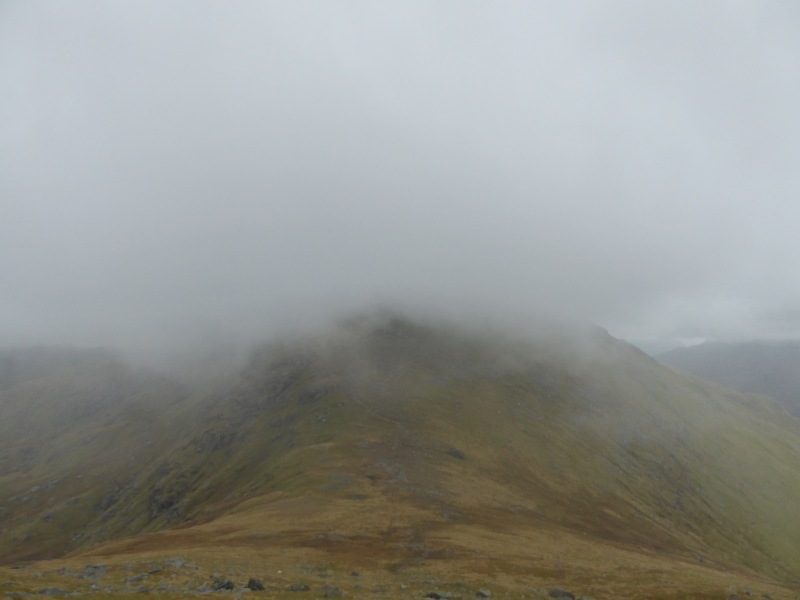 One cannot just ‘walk’ in the Highlands without respecting them; their weather and their awesome beauty – even under a high blanket of cloud. To say the least – I was apprehensive. I found all the somewhat indistinct tracks. The uphill was relentless. A lot of bogs, but at least the lovely Bog Asphodel was in flower. It was harder than any day on the Camino. Walking these hills – for the first time on my own – is hard. I realise more than ever the value of a friend in tough places. 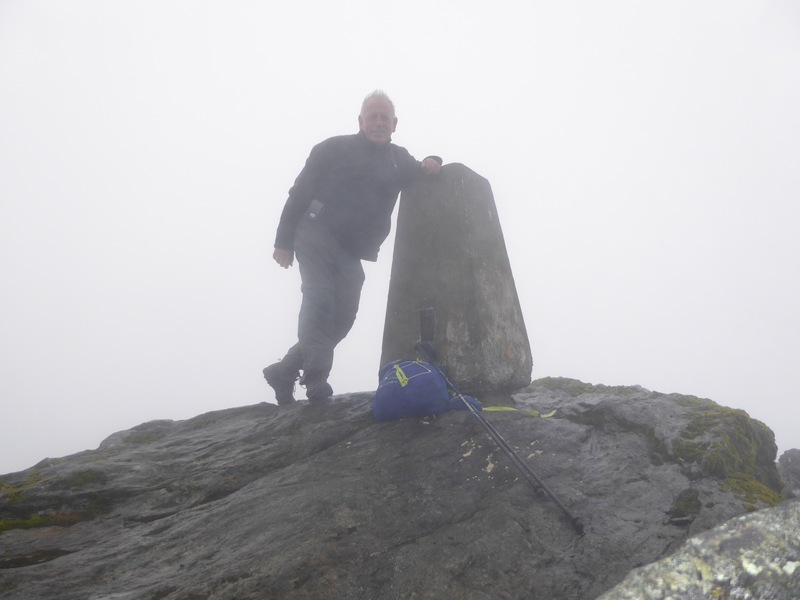 I reached the summit of Ben More after 2 1/2 hours. The wind and cloud (not per forecast) made it bitterly cold. On to Stob Binnein. I saw one walker descending at the bealach, having climbed to the summit. 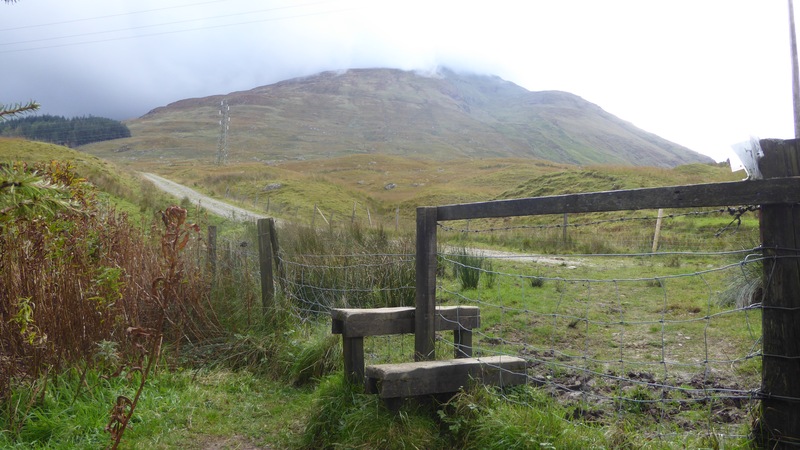 The climb was just as steep as Ben More – but thankfully less boggy. The downhill after Stob Binnein was knee-jarringly steep. In sections it was steep loose mud and steep loose rocks. My poor old knees gave up on me a couple of times, and I landed in deep, deep ooze. The sheep looked on and I swear – they were laughing. 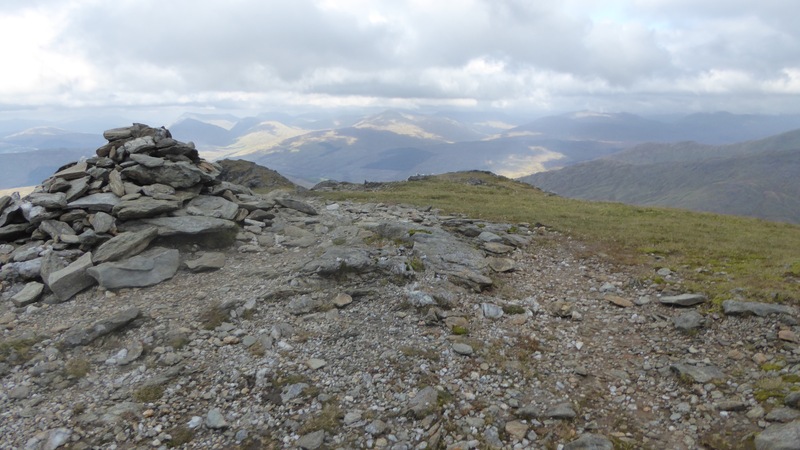 All in all – 1300m of ascent and descent. Only 13km, but oh, so steep. 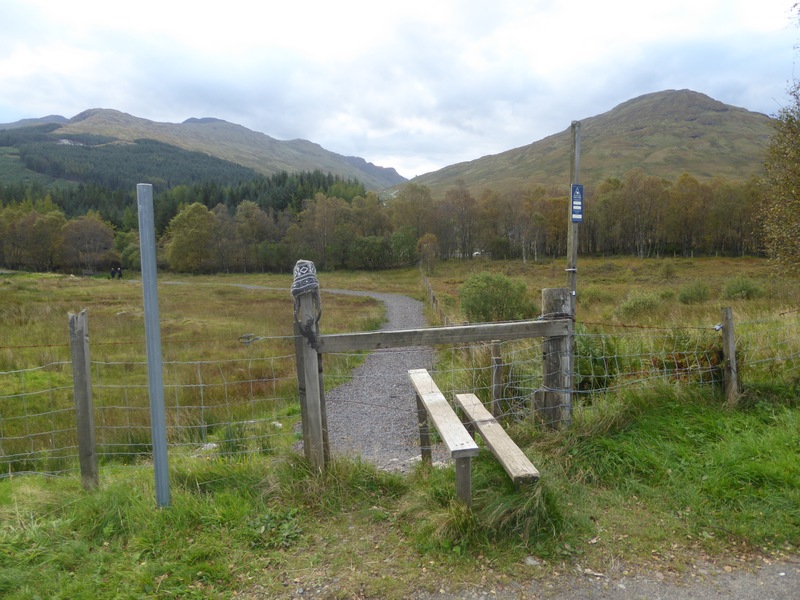 Back to The Munros…and – Target for tomorrow. 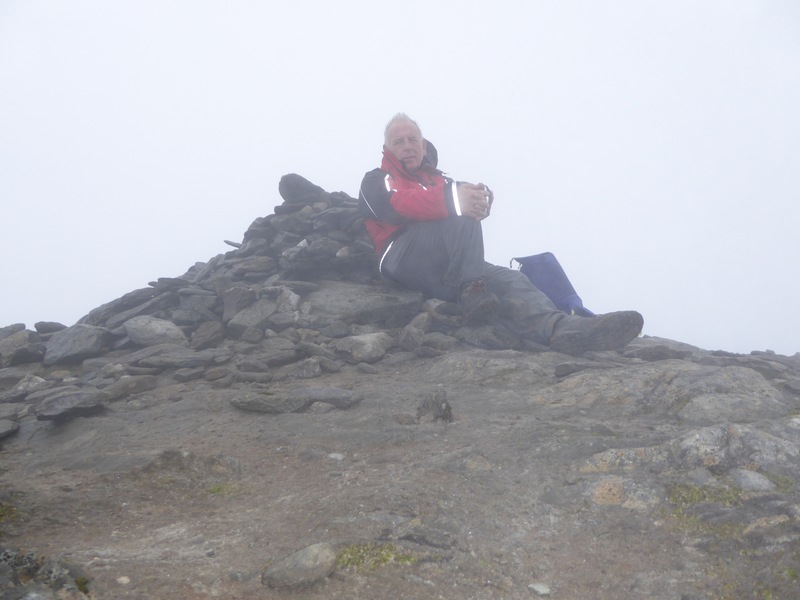 Many years ago, I set myself the challenge of climbing all the 284 Munros (summits – not all the outlying tops as well). I even said”..before the Millenium”. Well, life has a habit of laughing at our plans. 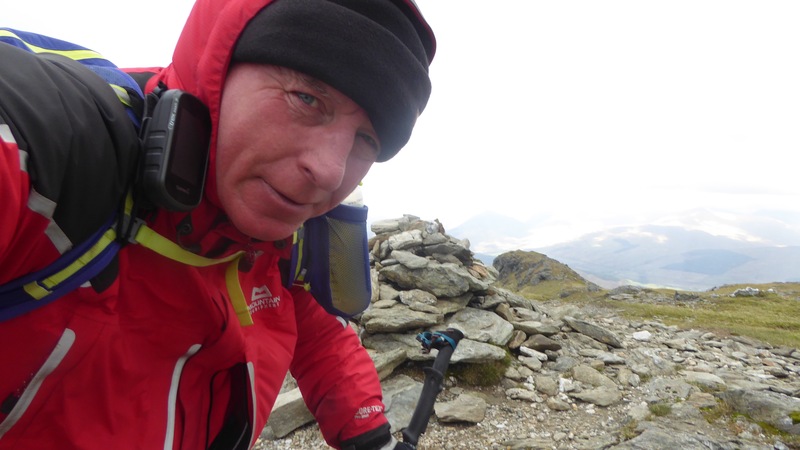 Now – over 19 years after my last Munro in April 1997 (An Socach with my beloved dog, Sam), I ‘try’ to restart my goal. 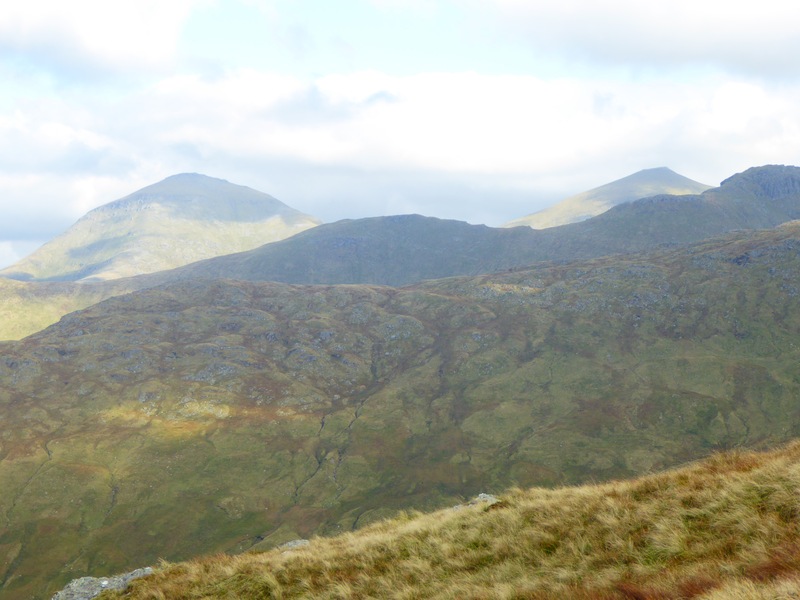 The target for tomorrow is Ben More and Stob Binnein. It is over, and I can now start to draw my conclusions. Shelley and I travelled to Fisterra where – last year – the mist was so thick that we could not see a thing. This year we got to see the famous boot beneath the lighthouse. 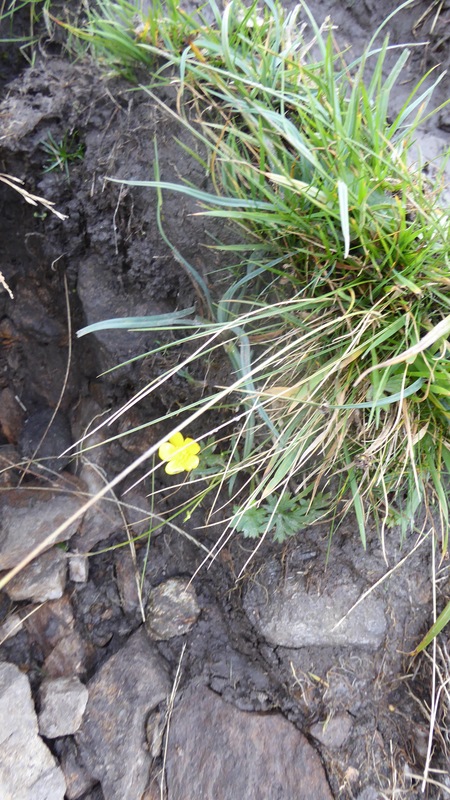 We also went to find the Pilgrim Stautue that we could not see last year. It is on Monte de Gozo, but about 0.75km off-route. Anyway – that mystery has been cleared. Now to the Camino itself. The Camino Português is about 75% of the length of the Camino Francés. It does not have the high scenery found in the Pyrenees, nor the Montes de León. It does have some beautiful countryside, especially between Alvaiazere and Coimbra and between Barcelos and Caldas de Rei. It also has a LOT of roads. I do not feel that I walked for such a large percentage of my time on roads, as I did through Portugal, and never sharing the same route as the main truck transportation route. The parts I did not enjoy were those where I felt I was walking along the main trunk roads of Portugal for hour-after-hour. The N10, N110 for example have relentless streams of big trucks passing just a couple of metres away form the walker. In the stretch from Lisbon to Porto, there seem to be many such sections as that, and it was a common concern from those pilgrims that I met. That may be one reason that only 3.5% of pilgrims arriving in Santiago de Compostela are finishing the Camino Portuguese. Of the 262,516 pilgrims who arrived in Santiago in 2015, only 2,059 (0.78%) had started in Lisbon. For such a well publicised route, this figure is remarkably low. Would I walk the Camino Francés again? Definitely. Would I do the Camino Portuguese again? Possibly. The route has the potential to attract many more pilgrims. The wonderful Portuguese people that I met (with the exception of a few drivers – road speeds are high and they make little allowance for pedestrians on the road) were welcoming, although many had little appreciation of the Camino de Santiago. I tend to think that Portugal itself needs to understand the significance of its countryside, its footpaths and its potential on the routes to Santiago. The Portuguese government departments for the environment could organise a study, then perhaps make some amendments to the route to allow for safer, or at least, less stressful footpaths to be opened to the Caminos. With more pilgrims comes the opportunity for more businesses in hospitality and catering to benefit. It would – I am certain – benefit the villages and towns along the route. I have contracted the ‘Camino Bug’. From now until I am too infirm and decrepit to walk, I shall find my way to a pilgrimage route at least once each year. Next year – the Via de la Plata from Seville. I already have our flights booked for two days after the Farndale Show.